Sunroof, 3rd Row Seat, NAV, Heated Leather Seats, Full-Time 4MATIC® All-Wheel Drive, NATURAL GRAIN BROWN ASH WOOD TRIM, TRAILER HITCH, WHEELS: 21 AMG® TWIN CROSS-SPOKE, Turbo, Alloy Wheels, Tow Hitch. AMG® GLS 63 trim, Lunar Blue Metallic exterior and Porcelain/Black Exclusive Nappa Leather interior. Warranty 4 yrs/50k Miles - Drivetrain Warranty; CLICK NOW! KEY FEATURES INCLUDE Leather Seats, Third Row Seat, Navigation, Full-Time 4MATIC® All-Wheel Drive, Power Liftgate, Rear Air, Heated Driver Seat, Heated Rear Seat, Cooled Driver Seat, Back-Up Camera, Running Boards, Turbocharged, Premium Sound System, Satellite Radio, iPod/MP3 Input. Rear Spoiler, MP3 Player, Keyless Entry, Privacy Glass, Remote Trunk Release. OPTION PACKAGES TRAILER HITCH: 7,500 lb towing capacity, NATURAL GRAIN BROWN ASH WOOD TRIM, WHEELS: 21 AMG® TWIN CROSS-SPOKE: (STD). Mercedes-Benz AMG® GLS 63 with Lunar Blue Metallic exterior and Porcelain/Black Exclusive Nappa Leather interior features a 8 Cylinder Engine with 577 HP at 5250 RPM*. KNOXVILLE AMG® PERFORMANCE CENTER IS DRIVING PERFORMANCE. 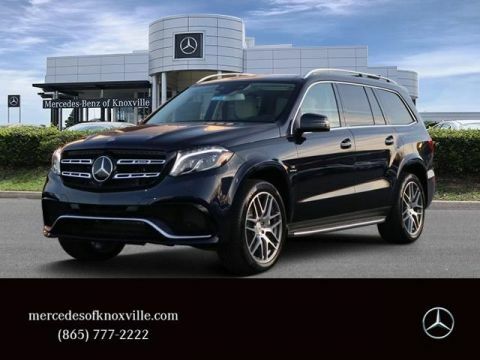 YOU BELONG HERE; DISCOVER AFFORDABLE LUXURY ONLY AT MERCEDES-BENZ OF KNOXVILLE! Horsepower calculations based on trim engine configuration. 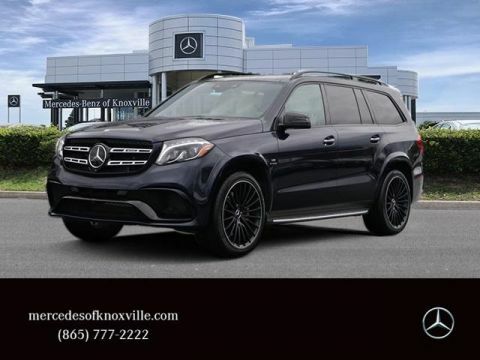 Please confirm the accuracy of the included equipment by calling us prior to purchase.Sunroof, 3rd Row Seat, NAV, Heated Leather Seats, Full-Time 4MATIC® All-Wheel Drive, NATURAL GRAIN BROWN ASH WOOD TRIM, TRAILER HITCH, WHEELS: 21 AMG® TWIN CROSS-SPOKE, Turbo, Alloy Wheels, Tow Hitch. AMG® GLS 63 trim, Lunar Blue Metallic exterior and Porcelain/Black Exclusive Nappa Leather interior. Warranty 4 yrs/50k Miles - Drivetrain Warranty; CLICK NOW! Leather Seats, Third Row Seat, Navigation, Full-Time 4MATIC® All-Wheel Drive, Power Liftgate, Rear Air, Heated Driver Seat, Heated Rear Seat, Cooled Driver Seat, Back-Up Camera, Running Boards, Turbocharged, Premium Sound System, Satellite Radio, iPod/MP3 Input. Rear Spoiler, MP3 Player, Keyless Entry, Privacy Glass, Remote Trunk Release. TRAILER HITCH: 7,500 lb towing capacity, NATURAL GRAIN BROWN ASH WOOD TRIM, WHEELS: 21 AMG® TWIN CROSS-SPOKE: (STD). Mercedes-Benz AMG® GLS 63 with Lunar Blue Metallic exterior and Porcelain/Black Exclusive Nappa Leather interior features a 8 Cylinder Engine with 577 HP at 5250 RPM*. Sunroof, DVD Entertainment System, Heated Leather Seats, Navigation, 3rd Row Seat, Full-Time 4MATIC® All-Wheel Drive, Turbo Charged, BANG & OLUFSEN BEOSOUND SOUND SYSTEM, AMG® PERFORMANCE STEERING WHEEL, TRAILER HITCH, Trailer Hitch, WHEELS: 22 AMG® MULTI-SPOKE, MATTE BL..., REAR SEAT ENTERTAINMENT, The 2018 Mercedes-Benz GLS-Class is supremely confident on slippery roads thanks to the Dynamic Select modes on the drivetrain, which includes a Slippery setting. -KBB.com. Lunar Blue Metallic exterior and Porcelain/Black Exclusive Nappa Leather interior, AMG® GLS 63 trim. Warranty 4 yrs/50k Miles - Drivetrain Warranty; AND MORE! KEY FEATURES INCLUDE Leather Seats, Third Row Seat, Navigation, Full-Time 4MATIC® All-Wheel Drive, Power Liftgate, Rear Air, Heated Driver Seat, Heated Rear Seat, Cooled Driver Seat, Back-Up Camera, Running Boards, Turbocharged, Satellite Radio, iPod/MP3 Input, Onboard Communications System. Rear Spoiler, MP3 Player, Remote Trunk Release, Privacy Glass, Keyless Entry. OPTION PACKAGES BANG & OLUFSEN BEOSOUND SOUND SYSTEM: Tirefit Mobility Kit, REAR SEAT ENTERTAINMENT, WHEELS: 22 AMG® MULTI-SPOKE, MATTE BLACK: Tires: 285/40R22 Performance, TRAILER HITCH: 7,500 lb towing capacity, AMG® PERFORMANCE STEERING WHEEL: DINAMICA handgrips. Mercedes-Benz AMG® GLS 63 with Lunar Blue Metallic exterior and Porcelain/Black Exclusive Nappa Leather interior features a 8 Cylinder Engine with 577 HP at 5250 RPM*. KNOXVILLE AMG® PERFORMANCE CENTER IS DRIVING PERFORMANCE. Knoxville AMG® Performance Center is Driving Performance Horsepower calculations based on trim engine configuration. Please confirm the accuracy of the included equipment by calling us prior to purchase.Sunroof, DVD Entertainment System, Heated Leather Seats, Navigation, 3rd Row Seat, Full-Time 4MATIC® All-Wheel Drive, Turbo Charged, BANG & OLUFSEN BEOSOUND SOUND SYSTEM, AMG® PERFORMANCE STEERING WHEEL, TRAILER HITCH, Trailer Hitch, WHEELS: 22 AMG® MULTI-SPOKE, MATTE BL..., REAR SEAT ENTERTAINMENT, The 2018 Mercedes-Benz GLS-Class is supremely confident on slippery roads thanks to the Dynamic Select modes on the drivetrain, which includes a Slippery setting. -KBB.com. Lunar Blue Metallic exterior and Porcelain/Black Exclusive Nappa Leather interior, AMG® GLS 63 trim. Warranty 4 yrs/50k Miles - Drivetrain Warranty; AND MORE! Leather Seats, Third Row Seat, Navigation, Full-Time 4MATIC® All-Wheel Drive, Power Liftgate, Rear Air, Heated Driver Seat, Heated Rear Seat, Cooled Driver Seat, Back-Up Camera, Running Boards, Turbocharged, Satellite Radio, iPod/MP3 Input, Onboard Communications System. Rear Spoiler, MP3 Player, Remote Trunk Release, Privacy Glass, Keyless Entry. BANG & OLUFSEN BEOSOUND SOUND SYSTEM: Tirefit Mobility Kit, REAR SEAT ENTERTAINMENT, WHEELS: 22 AMG® MULTI-SPOKE, MATTE BLACK: Tires: 285/40R22 Performance, TRAILER HITCH: 7,500 lb towing capacity, AMG® PERFORMANCE STEERING WHEEL: DINAMICA handgrips. Mercedes-Benz AMG® GLS 63 with Lunar Blue Metallic exterior and Porcelain/Black Exclusive Nappa Leather interior features a 8 Cylinder Engine with 577 HP at 5250 RPM*.